This is a C++ program which outputs a Mandelbrot fractal image in a graphics window and lets the user zoom and pan around the image, generating a new image each time the user does so. I'm using SFML for the graphics part. Because it generates a new image after every zoom or pan, it is pretty slow, especially with a 1000x600 image (it can take up to half a second for the new image to load). 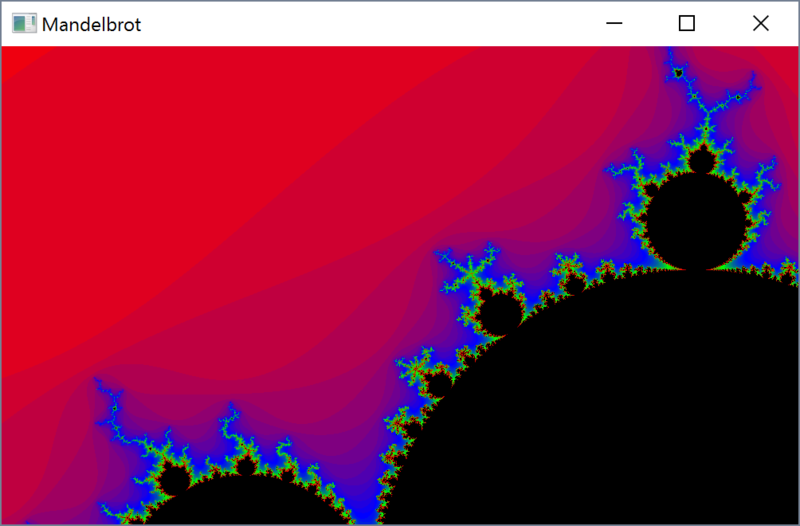 The value of -1 is used to represent points within the Mandelbrot set, but then this value is explicitly checked when assigning a color and is equivalent to MAX. Why not simply assign the value of MAX and avoid the special case? Using == with floating point numbers is generally not a good idea because if they differ only by some small amount (say 1e-99), they are not equal. In fact, if you modify the code to count the number of times that statement evaluates to true, I think you will find that it never does and is therefore simply wasting time. For more depth about floating point issues, I'd recommend the excellent article "What every computer scientist should know about floating-point arithmetic" by David Goldberg. Several changes were made here. First, since the original third parameter maximum was always passed in with the value of MAX, it was simply eliminated from the parameter list and the value MAX substituted directly. Next, the loop is now a for loop instead of a while loop which makes the structure more obvious. Next, the r2 and i2 values are precomputed, making the code a little shorter and simpler (and probably more efficient). Lastly, the early bailout is done within the loop. Only if we get to the end of the loop does the value MAX get returned. The window.clear() call near the end of main is not needed since the following line writes the entire window anyway. That line can simply be eliminated. All but MAX can be made local to within main. Unless there is a reason to do so, you might find that eliminating the call to window.setFramerateLimit or setting the value to 0 allows the program to be more responsive. After I applied all of the suggestions mentioned above, I found that the framerate limit was the thing preventing further speed increases on my machine. Right now any key (even those that have no effect, cause the screen to recalculate. This is easily fixed by adding stateChanged = false; to the default case in the key event handling switch statement. With this, things are noticably faster and look good until I get to a zoom factor of around 2e-16 or smaller, where there is noticable banding due to the previously mentioned floating point issues. A more careful reworking of the calculations could eliminate or defer that, but I didn't take the time to do so. Also I should point out that sharing a single reference to the image variable is not generally the way to handle shared threads because it leads to at least the potential of a data race and corruption. However, as I guessed, the structure of the image object is such that the threads do not seem to contend for the same memory locations. Per request in the comments, here's the entire thing. This actually goes a few steps farther in that it turns most of the program into a Mandelbrot object and also scales the number of threads per std::thread::hardware_concurrency. It requires a C++11 compliant compiler. Unlike in Python, all-caps names are usually left to macros (which you should avoid, by the way) in C++; for example: M_PI, CHAR_BIT and so on. constexpr: pure constants and magic numbers should be declared as constexpr. Constants could also be collected in a namespace (e.g. namespace constants) or under enums. The maximum mandelbrot could default to MAX i.e. zoom should have a maximum level and therefore you should ensure it's not broken (double-s are signed). I'm going to comment mostly on performance aspects of your code here. Stylistic parts of your code should be improved upon by someone more conversant in C++ than I am. You have factored out some constants, but when you calculate zooming, 0.9 and 40 are "magic numbers", numbers with no explanation as to what they do, and those whose usage entails updating values at multiple locations when you change them. Maybe you would like to make them constants and call them ZOOM_DOWN_FACTOR and ZOOM_UP_FACTOR respectively. I realize compiling with -O3 and -ffastmath might make your compiler turn those pow() calls into plain multiplications, which are faster, so compile for release with those options. To compensate for floating-point inaccuracies, you should factor in a small Epsilon (maximum allowed deviation) value of about 10-15. Try changing your bailout condition to <= 4.0 + 10-15. One pointer for faster panning: factor out your image generation code into a different method from main(), which accepts parameters defining the range of pixels of the image which should be subjected to Mandelbrot calculation. Call this function on every pan event with the range of pixels which have been invalidated due to the pan, get this image with some blank pixels and merge it with the old image to get the panned image. Should make panning orders of magnitude faster. counter >= maximum is unnecessary. An == will do just fine here. Suggestion: Use return instead of break after executing window.close() in the relevant case statements. Should avoid a potential memory leak. (Thanks @pacmaninbw for bringing this to my notice). Implement a suitable form of color smoothing. Linear interpolation should help. Its a bit bit expensive on performance, but it vastly improves image quality. Exponential smoothing should help provide a suitable interpolation value. This is the formula: expiter += exp(-cabs(z)-0.5/(cabs(zold - z))). Here, exp(x) is the standard exponential function e^x, your math library has it. zold and z are complex numbers, zold is the value of z from the previous iteration. cabs(z) returns the square of the modulus of z (basically the sum of the squares of the real and imaginary components of z). expiter is the fractional or smooth iteration count. Mandelbrot images are calculated with complex numbers. C++ offers the <complex> header which contains a template for generating complex numbers out of floats or other numeric types. Many compilers can give you warnings about code paths with uninitialized variables but in general it might be good to zero initialize your r, g, and b values to zero at the beginning of the getColor function. This also allows to remove all later zero assignments in the ifs. The results of different pixels are independent of each other. This screams for parallelization. It might suffice to use OpenMP's parallel for. I have to start with saying that this is a really cool and well made project! If you would like to improve the performance of your code, I recommend offloading work to GPU shaders. mandelbrot easily fits into the description of a fragment shader. You can use OpenGL through SFML to achieve this, see this and this. int mandelbrot - this function returns number of iterations, name mandelbrot does not tell anything about its purpose. I see you already have got many answers about good code practices like naming conventions and other good things. Here's some optimization help for computational algorithms for modern CPUs in general. Replace conditionals (if, while, switch-case) inside loops with arithmetics whenever it is possible. This is important to not risk destroy instruction pipelining in modern processors. 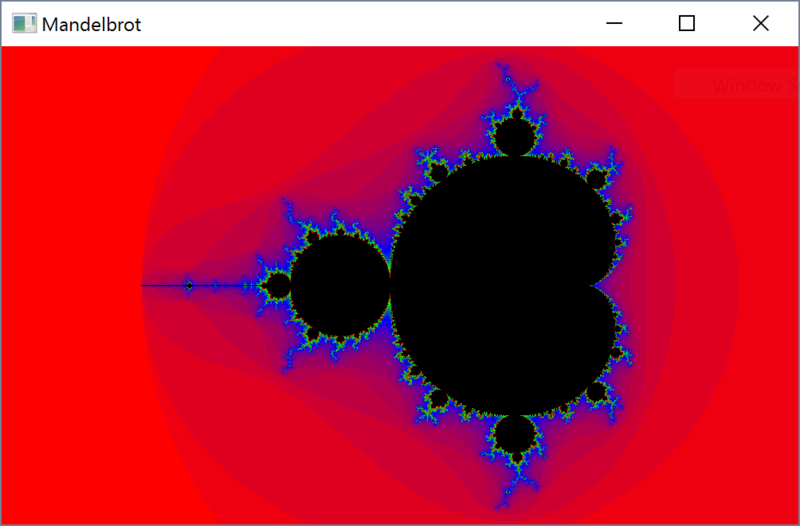 Examples in code: if's and whiles inside mandelbrot and getColor functions. Optimization settings for your compiler. Allow it to optimize, try and unroll loops if it can, help it pick good assembler instructions by letting it know what CPU you have. Allow it to inline function calls if the function calls are in loops. Maybe use fast instructions and lower precision (for example float instead of double) if reduced precision is OK. I suspect you can use fast instructions without any problems on this particular program. Examples in code: allowing the compiler to do inlining can avoid branching on the calls to the mandelbrot and getColor functions (which are inside the loops). Memory planning and structuring. Plan the data structures and calculations to utilize the RAM caches as much as you can. Difference between missing and hitting caches can easily affect performance tens to hundreds of times. Not the answer you're looking for? Browse other questions tagged c++ performance sfml fractals or ask your own question.